My husband and I have the same discussion every few months. We’ve already cut our meat intake but get bored with only veggies and lack of recipes ideas. Ultimately, it leads to more take out. We decide we should eat fish more often. Like a lot more fish–at least twice a week. I come home with some black bass to broil or pan fry or maybe some scallops to sear. Sometimes there’s some dine out sushi thrown in there. We eat, admire how tasty the meal was, then go back to our normal habits of low meat, lots of veggies and grains and take out. Three months later, repeat. It’s not that we don’t like fish. We love it actually. I often choose fish when dining out (if my head isn’t clouded by the drool-worthy duck or venison dish on the menu) but fish in general always feels more like a special meal, not an everyday thing. Why? Well there’s an education barrier and large learning curve we need to defeat. Recently I learned to sear perfect scallops. We won’t go into the months of practice and meals of well cooked scallops but ones that appeared to be baked, without any bit of seared crunch, or the ones that were just black. I can cook a fillet of fish, generally something white and flaky, which is done in one of two ways: baked with lemon juice and slices of lemon or broiled with lemon juice and slices of lemon. And that would be the extent of my fish knowledge. Fish kind of scares the crap out of me. I’m not sure why. It just seems so foreign. Growing up dinner was mostly chicken, sometimes London broil and occasionally other cuts of steak. When we had fish it was prepackaged fish sticks or frozen flounder. I honestly don’t even remember how my mom prepared the flounder. I always refused to eat it. Fish was just gross. When I was in college, I started to come around. First with sushi (I didn’t drink soda, so I needed to find some common ground to help me fit in with the “cool” kids), then moved on to mild fishes, where I continue to hover. I didn’t know that fresh fish tasted so different from frozen fish. After all, fresh vs. frozen meat and chicken doesn’t differ that much (most of my meat still comes frozen from the greenmarkets or farms). Being tired with my lack of fish education, I’ve decided to go full in. Well almost. I have no intentions of buying a whole fish entirely intact yet, but at this very moment I have two butterflied Bronzino fish sitting in my refrigerator for dinner tonight. Rubbed with oil and stuffed with lemon and spices–I’ll let you know how it goes. Last week I came home with Halibut steaks. After learning how much I paid (I really need to look at this stuff in advance), I knew I’d be forced to do something spectacular with them. Sometimes spectacular doesn’t need to be fancy though. Olive oil, lemon, cream and seasoning is sometimes all you need. And surprisingly easy. Maybe fantastic fish isn’t as challenging as I thought. My biggest piece of advice for this recipe? Remind your guests of the giant bone running through the center of the steaks before they take a giant bite (Sorry hubby…). Rinse steaks and pat dry. Season generously with salt and pepper, then sprinkle with flour. Melt butter in a medium skillet over medium high heat. 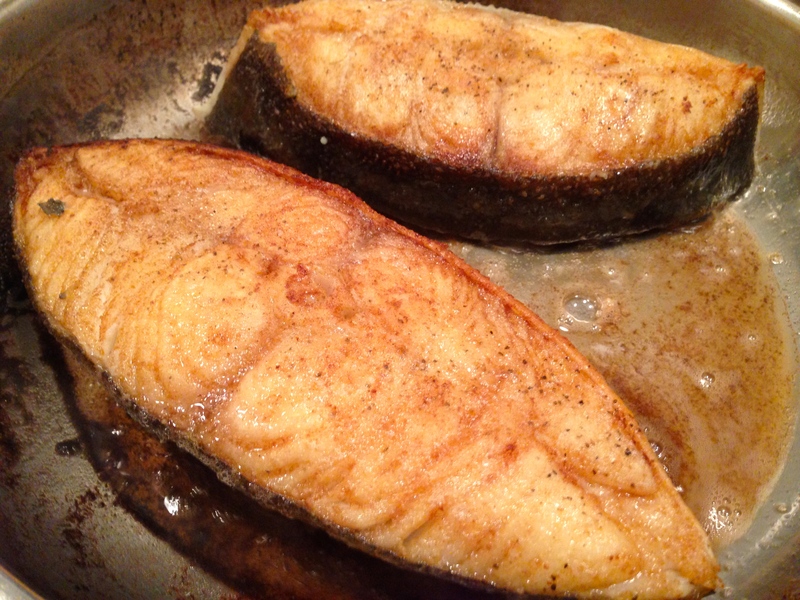 When butter starts to brown, add fish, frying on each side for 2-3 minutes (if your steaks are really thick, cover skillet to assure fish cooks through. Transfer halibut to a large plate and keep warm. Reduce heat to medium and add vermouth and garlic, scrapping any brown bits from the pan. 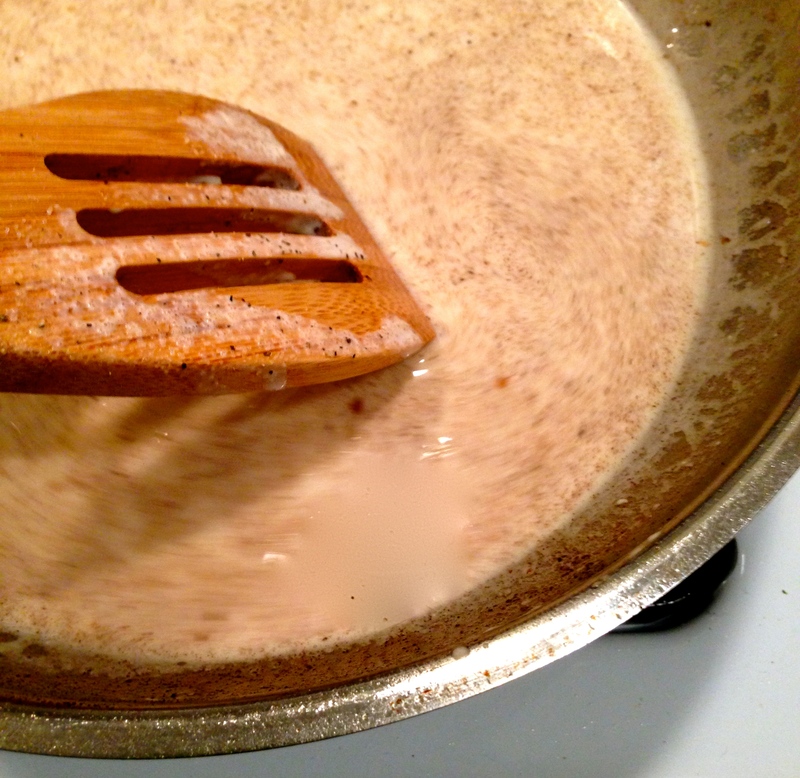 Stir in lemon juice, heavy cream and bring to a boil, allowing sauce to thicken slightly. Season with additional salt and pepper to taste. Plate fish and spoon over sauce to serve. I need to do the same, more fish. Wonderful recipe. Thanks Suzanne. And sorry for the delayed reply. I feel like the fish addition is much easier in the warmer months, as I spend more time at the greenmarkets then. Wonderful recipe. I love the dressing of the food. 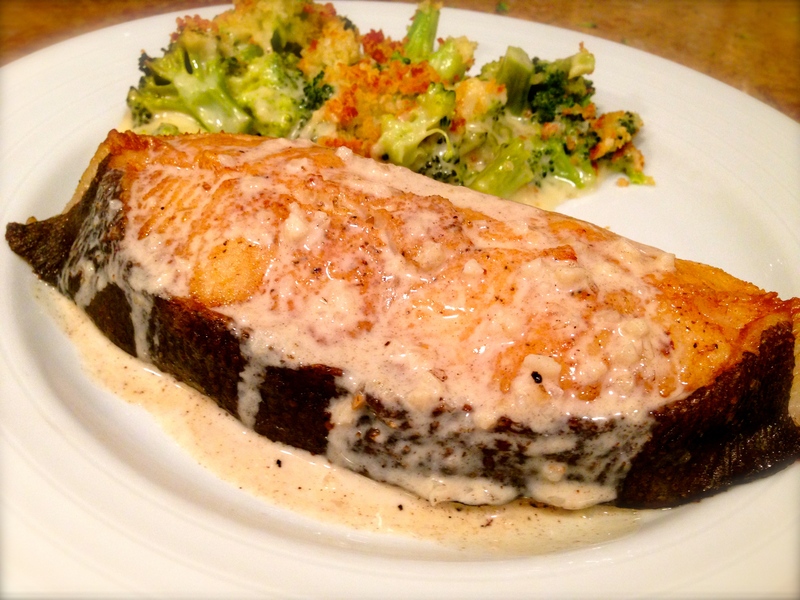 Cream sauce added a new taste to the dish. Thanks Julie. It really does! A richness but still overall light. I would like to have more fish in my diet too especially in the warmer months. It makes such a light, lovely meal.